Cindy Sherman on James Franco's Pace Exhibition: "I Don't Know That I Can Say It's Art"
They say imitation is the sincerest form of flattery, but they never said anything about it being art. 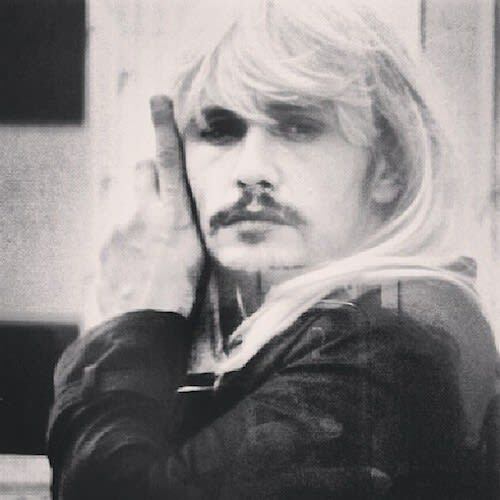 At Pace Gallery right now, James Franco is exhibiting his "New Film Stills" series in which he recreates Cindy Sherman&apos;s Untitled Film Stills. For the series, Franco mimics the attire, poses, and compositions of the original photographs with himself as the subject. When asked how she felt about the exhibition, Sherman told Gallerist, "I was flattered, I can only be flattered," then she added, "I don’t know that I can say it’s art." Franco is no stranger to criticism of his "art," but a comment like that from the artist that inspired this body of work probably hurts a little more than the opinions of art critics. If it&apos;s any consolation, she did say that his spoof with Seth Rogen of Kanye West&apos;s "Bound 2" video was "hysterical." "New Film Stills" is showing through May 3. Head to Pace Gallery&apos;s website for more.